For individual song lyrics click on titles! - Order the video now! October 8, 1995 marked a milestone in Musical Theatre. 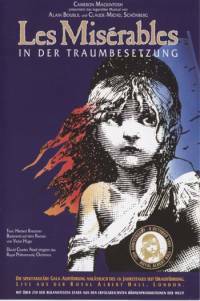 Les Misérables celebrated its 10th Birthday in the West End. Especially remarkable as it received horrible reviews at the beginning and no one believed the musical to last longer than just a couple of weeks. In the very beginning it was only planned for a three months run at the Barbican Theatre. Unexpectedly though it became a sure fire hit and had to move into another theatre. The Palace Theatre then became the home for Les Mis for a mere 18 years before it moved once more, now to the Queens Theatre. For this very concert the producers were able to gather what's maybe the best cast Les Mis had ever seen: The Dream Cast! Enjoy this special evening, this recording, that converted many, many people all over the world to Ballettes!